Ralph Wendell Burhoe was a twentieth century pioneer interpreter of the importance of religion for a scientific and technological world. He helped to found the Journal of American Academy of Arts and Sciences: Daedalus. Born in Somerville, Massachusetts, on 21 June 1911, Burhoe attended Harvard from 1928 to 1932, but dropped out before he could complete his degree. In 1935-36, he spent eighteen months in theological study at Andover Newton seminary. At one point, shortly after he was married in 1932 to Frances Bickford, when he and his wife were both penniless and unemployed, they retreated to a log cabin on the side of Mount Washington to “meditate upon their situation.” His search in these years, as during his long lifetime, was to find “ontological and rational supports for the sacred meaning of his life.” Those supports were eroded, Burhoe believed, for himself and for many persons, by the alienation that separated the traditions of meaning and value carried by humanity’s religions from the knowledge attained by science and applied in technology. He was moved deeply by the confusion and meaninglessness that afflicted so many persons, and believed the root of the problem lay in this alienation of science from religion. After he left his formal studies, in 1936 Burhoe became assistant to the director of Harvard’s Blue Hill meteorological observatory, a position he held until 1946. During this time he was active in the American Meteoreological Society and founded the journal Metereological Abstracts as an organ for gathering international weather data, much of which was useful for military intelligence during the Second World War. From 1947 to 1964, Burhoe served as the first executive officer of the American Academy of Arts and Sciences. This position brought him into contact with the finest scientists of the time, serving to provide the intellectual resources that he had not found in formal academic studies. Harlow Shapley (astronomy), Kirtley Mather (geology), George Wald (biology), and Hudson Hoaglund (biology) were among his closest mentors. He was instrumental in establishing the Academy’s journal, Daedalus, and its Committee on Science and Values. Convinced that science does not threaten the wisdom of traditional religion, but rather reinforces it, Burhoe developed an extensive theoretical framework to explain how religion emerged within the evolutionary process. His system of thought included the concept of God as demonstrated through the processes of natural selection, which, however, did not depend entirely on brutal competition. In fact, he saw trans-kin altruism, or love, as the central factor that enabled human culture to survive. The nub of his theories was the recognition that in the brain—the element that has given Homo sapiens its distinctiveness—genetic evolution converged with culture and its evolution. Culture carries the information that tranforms the “ape-man” into a genuine human being. And it is the religious traditions that have carried core information, about how humans can live together and thereby reach their full evolutionary potential. This core information has been transmitted in the religious teachings that insist on altruism beyond the kin group, and it is this information that evolution has selected for, thus establishing the human species and its dominance. In one of his last published articles (1987), “War, Peace, and Religion’s Biocultural Evolution,” Burhoe argued that religion’s success in sublimating the violent behaviors of smaller groups by fostering altruism within the larger religious community must now be extended to include the entire human race as the primary community. In spite of its failures up to now in this effort, he believed that religion was humanity’s best hope for achieving peace. His theories of how religion has emerged and functioned within the evolutionary process were intended as intellectual supports that would help people understand how, through religion, they could reach the goal of full trans-kin altruism. An imaginative evolutionary concept of the soul and its immortality extended the scope of this theoretical framework. The information that comprises the personal center of a human being is released at death into the larger stream of cosmic information and continues its course through the selective processes of evolution. In their totality Burhoe’s theories presented a comprehensive explanation of how traditional religion could be translated into serious scientific theories. Although this explanation was never recognized as the scientific advance that Burhoe envisioned, it was warmly received by some of the leading scientists who knew Burhoe, and it attracted many of them to his work and to conversation with religious thinkers. Among these scientists were Shapley, Mather, Hoaglund, Wald, E. O. Wilson (biology), Erwin Goodenough (history of religions), Anthony F. C. Wallace (anthropology), Mihaly Csikszentmihalyi (psychology), Solomon Katz (anthropology) and others. Writing in 1992, Roger Sperry, a Nobel Prize winner for brain research, observed that “in the history of efforts to join religion and science, none appears to have achieved more wide and lasting impact than the venture of Ralph Wendell Burhoe.” Within the broad range of attention that was directed toward relating religion and science after the Second World War, Burhoe was distinctive for his effort to work with both mainstream scientific and religious thinking. A number of these scientists, including those who were members of the Academy Committee on Science and Values, were responsible for that committee’s becoming, in 1956, the nucleus of the Institute on Religion in an Age of Science. This Institute was the first of a number of enterprises founded by Burhoe. 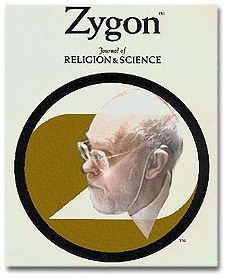 These include Zygon: Journal of Religion and Science, 1966, which under Burhoe’s editorship became a renowned interdisciplinary vehicle, the only refereed academic journal in this field. The journal was supported largely through the efforts of Meadville/Lombard Theological School in Chicago, to which Burhoe had been called as a professor in 1964. The Center for Advanced Studies in Religion and Science was established in 1972. 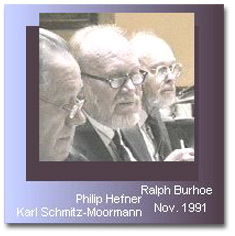 In 1988, Burhoe founded the Chicago Center for Religion and Science, in cooperation with the Lutheran School of Theology at Chicago. The latter school was the scene of his major work when he retired from Meadville in 1974. The earliest formulations of his theories found expression in the early 1960s in his work for the Commission for Theology and the Frontiers of Learning, established by the Unitarian Universalist Association. He elaborated his thought through many essays published in Zygon and other journals. A collection of essays was published in 1980 under the title, Toward a Scientific Theology. David Breed’s biography, Yoking Science and Religion: The Life and Thought of Ralph Wendell Burhoe (Zygon Books) appeared in 1992. In addition to the Templeton Prize, Burhoe’s achievements were recognized by honorary doctorates from Meadville Lombard Theological School (1977) and Rollins College (1979). The Society for the Scientific Study of Religion, of which he was a founder, bestowed on him its first Distinguished Career Achievement Award in 1984. He was a fellow of the American Association for the Advancement of Science, the American Academy of Arts and Sciences, and the World Academy of Arts and Letters. Ralph was long active in the life of Unitarianism’s historic Arlington Street Church, Boston. When a professor at the Unitarian Universalist Meadville Lombard Theological School from 1964-1974, he was an active member of the First Unitarian Society.